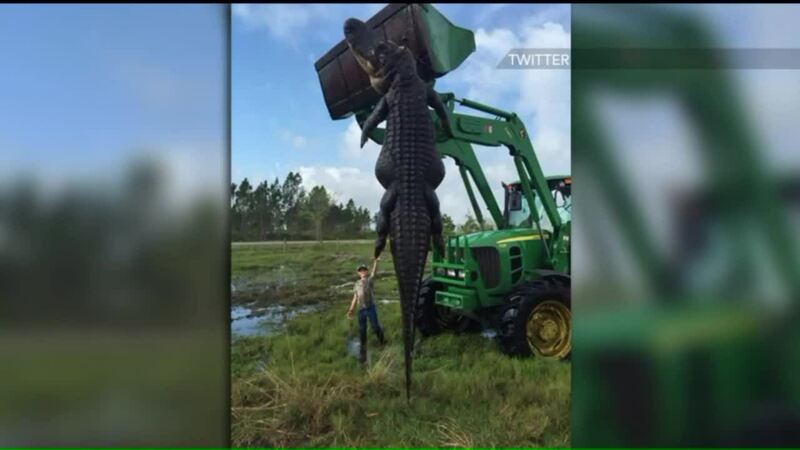 OKEECHOBEE, Fla. (WPIX) -- Two hunters tracked down and killed a 15-foot alligator who was likely snacking on cattle. The 800-pound monster gator was shot at Outwest Farms, an alligator hunting company in Florida. Lee Lightsey, who owns the farm, and Blake Godwin, a hunting guide, discovered the alligator in a cattle pond during a guided hunt on April 2. Lightsey and Godwin said the gator had been eating their cattle. "We also discovered the remains [of] what we determined to be cattle in the water. We determined that he was in fact attacking our livestock as they came to drink," Godwin told WOFL. A farm tractor was used to pull the gator from the pond. "Lee Lightsey and I had the pleasure of doing a guided gator hunt this morning and killed the largest gator we have ever killed in the wild!! He measured out at just under 15 foot!! Congratulations to Chris and Derek on their monster!!!"